The basic idea of acupuncture is based on the “Yin and Yang five elements theory”. The “Yin-yang five elements theory” is a combination of the Yin-yang theory that divides things into yin and yang, and the five elements theory that divides wood, fire, earth, metal and water into five elements. Five elements are called as “moku, ka, do, gon, sui” in Japan. So, all things consists of the five elements, ‘moku, ka, do, gon, sui ‘. Acupuncture, in particular, divides human organs into the work of the whole body, into Yin and Yang and five elements. 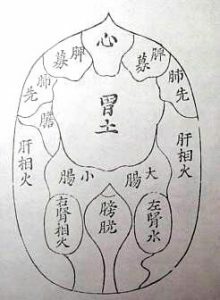 I look at the patient’s body based on this yin-yang and five elements theory, but tension appears in the abdomen of the person who has a sickness or an unpleasant symptom. The “abdominal tension” is considered to represent the state of the gastrointestinal tract, heart, liver and gallbladder as shown in the figure. And when the “abdominal tension” disappears, it is thought that the internal organs are in good shape and in good health. In our hospital, we mainly use acupuncture points in the limbs to relieve such “abdominal tension”. The basic idea of acupuncture is that “the abdominal tension” disappears and the internal organs become in good condition, and as a result, “the symptoms and diseases shown in the table get better”. For example, mental stress may cause tension and pain and discomfort. In the above figure, it is thought that mental effects occurs stomach discomfort, that is, “mind” makes effects to “stomach”. There are many patients who say “It looks like magic” when “abdominal tension” softens before and after treatment, but it is neither magic nor a shame. In the case of stiff shoulders and low back pain, it is possible to take therapeutic measures such as simply loosening muscle tension, but it is the essence of acupuncture and moxibustion to keep in mind from mental stress and the body. In our hospital, we do not say that only the shoulders are hit because the shoulders are stiff, or because the waist is hard, only the shoulders are hit. Because the treatment is performed based on the idea of getting health from inside the body, it can cope with atopic dermatitis and Graves’ disease as well as stiff shoulders and low back pain. I hope you feel safe, be convinced, trust, and be received my treatment. The director himself will treat as if “don’t know who to treat”. In recent years, there have been many cases in which unqualified persons have troubled as a result of treatment, but the director of our hospital goes to a vocational school, and the national qualifications such as acupuncturist, anma-massage-shiatsushi, judo reparation. Please be assured that you have acquired. In my clinic, based on oriental medicine, I will examine the condition of the patient’s body by combining the knowledge of anatomy and physiology in western medicine. 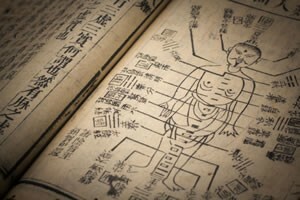 Some people have images of pain and heat in the treatment of acupuncture and moxibustion, so in order to receive medical treatment with confidence, special treatment books such as anatomical books and physiology will be provided. I sometimes explain while showing it. The treatment will be started upon consenting to the director’s diagnosis and treatment policy, so please feel free to ask us anything. Many clients are coming to my clinic for the following reasons. ・ Because I had side effects of medicine, I was looking for other treatment methods. ・ Doctor told you the cause is unknown. ・ There is no problem with the result of the examination but the physical condition is strange. ・ You were looking for treatment other than medicine and surgery. ・ You tried to go to other treatment clinics and manipulative, but you did not improve. The main house is a 10-minute walk from JR Sannomiya, Hankyu Hanshin Sannomiya and Kobe municipal subway Sannomiya, and has you come to visit from a distance. My clinic is a 10-minute walk from Chuo-ku, Kobe City, JR Sannomiya Station, Hankyu Hanshin Sannomiya, and Kobe Municipal Subway Sannomiya. My clients come from Himeji City, Kakogawa City, Akashi City, Kobe City Suma Ward, Nada Ward, Higashinada Ward, Kita Ward, Nishi Ward, Chuo Ward, Toyonaka City, Nishinomiya City, Ashiya City, Habikino City, Osaka City, Nara City, etc. I named my clinic as “Apple Health Clinic” after an old proverb from England saying, “I need a doctor every day with an apple,” with the idea that “people who come to my clinic can stay healthy.” The patient is familiar with saying “I’m going to Ringo-san!” Or to “Ringo-Sensei”. The treatment method for acupuncture and moxibustion has a long history, and not only low back pain and stiff shoulders, but also numbness of arms and legs, back pain, atopic dermatitis, Graves’ disease and Hashimoto’s disease (hypothyroidism) Such as glaucoma, hay fever, headache, stomachache, canker sores, menstrual disorder, menopausal disorder, depression or autonomic ataxia, panic disorder, infantile enuresis, etc., or discomfort.